Speaking of my LiveJournal, I've written a few entries there in the last year or two about splogs and link farms. A splog is a spam blog. A link farm is a web page full of links and ads. Both tend to be mostly nonsense, blocks of text from legitimate sites, harvested for their keywords to fill a page, linking to each other to improve their PageRank with Google and the rest, all so you'll click on an ad and they can make a buck. Anyway, John mentioned to me that the latest issue of Wired has an article about the menace of splogs as they start to overwhelm the legitimate blogosphere. I've been reading it in our print copy of the magazine tonight. It's pretty alarming. One study claimed that 56% of "all active English blogs" (that's blogs in English with current content) are splogs. You don't want your work to be on a splog, the article says, because it can lower your blog's PageRank and damage your reputation. Check search engines like Technorati for uses of "your name, your site's name or its URL." "You'll recognize a splog by the unusual number of buzzwords in the main content area," the article says. "And splogs often redirect visitors to an entirely different site." Splogs get in the way of finding what you're actually searching for, and waste the resources of hosting services such as Blogger and blog search engines like Technorati. So report it when you see it. "If the splog is on Blogger, you can easily report it by clicking the Flag button on the top right corner of the page," the article says. "If the splog is on another blogging platform, you may have to contact the host directly." Or you can report a splot to a new service, Splog Reporter. The print article says that "in December, 2005, Blogger was hosting more than 100,000 sploggers." Blogger doesn't want to do that, and we don't want them to do that. So we should probably help to reduce that number a bit, yes? and if the splog uses AdSense, Google can revoke the account (and remember, Google owns Blogger). If you get a comment that says something like "Nice blog," followed by a link, it's probably comment spam. Kill it. I removed two of these a few days ago myself. A lot of the time, these are posted to months-old entries, in the hope that you won't notice. Sometimes the links are attached to asterisks instead of text to be less obvious. While they're there, they increase the PageRank of the splog or link farm or Viagra ad they link to. The print article is scheduled to go online September 5th. Or you can just buy the issue, which has lots of neat stuff in it anyway. In six days, another Round Robin Photo Challenge will be upon us. 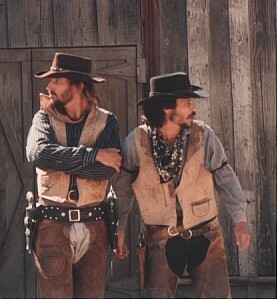 The topic this time, Nostalgia, comes from Dorn, of the blog, Through the Eyes of the Beholder. Nostalgia is all about remembering the past fondly, even longingly. So it's appropriate that I remember to promo this topic. Too often, I forget to do more than mention it in passing before the posting date. Anyway, here's a little teaser for it. 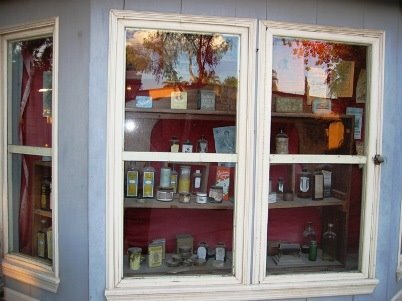 At Casa Blocher, better known as the Museum of the Weird, most nostalgia is about the 1950s and 1960s, one way or another. 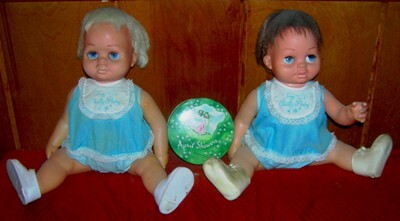 Many of the exhibits are in this vein, including these two dolls. They're both Chatty Baby. The bibs on the dresses actually call them Tiny Chatty Baby, but to me the doll was Chatty Baby. I had one when I was six years old, and was quite rude to my grandmother when she gave me a lesser doll that same Christmas. Neither of these dolls is the one I had when I was six. That's long gone, along with the one my grandmother gave me, and the one with the soft body and a music box inside that played Brahms' Lullaby. I got these two Chatty Babies a few years ago at Firehouse Antiques, either the same day or a week apart. The brown haired one still has a working record. The blond one does not. The doll was never all that intelligible, anyway. Being a baby, it mostly delivered babytalk, in glorious low fidelity. So why did I buy both dolls, instead of just the one that still sort-of talks when you pull the string? Simple. I can't remember whether my Chatty Baby had blond or dark hair, so I bought both versions. Nostalgia can drive us to do weird things, sometimes. If you're interested in participating in the Round Robin Photo Challenge, you still have almost a week to prepare before the posting date of September 6th. Click here for details, and don't forget to RSVP! These two sunset shots are from last night and tonight. The first one, of a building near St. Michael's, I thought was kind of interesting because of the way the wedge of sunset color framed the building. This other sunset shot was taken tonight. 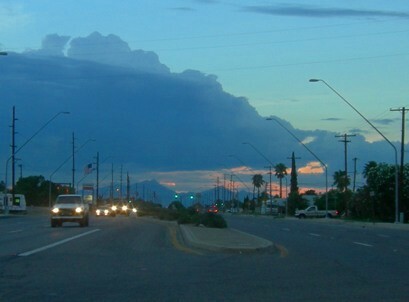 Those are the Santa Rita Mountains under that huge cloud. That's right - this "sunset" was to the south. 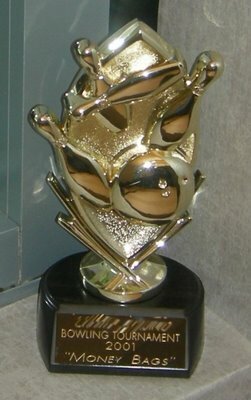 Monday Photo Shoot: John Scalzi posted a picture of his major award. Take a picture of an award or plaque or certificate. I concur! Post them over at Mavarin's site -- or post them here (or post them in both places!). With her permission, I'll post links on Thursday. Does that first paragraph look familiar? It should. I posted it last night. Today, John Scalzi did me the honor of using my Monday Photo Shoot idea for his "Ersatz Monday Photo Shoot (on Tuesday)." He even sent people over this way. Heck, had I realized that was coming, I'd have taken the time to try again for a decent photo. In any case, this is my chance to upgrade last night's photo and add some new ones here. No, I wasn't at LA Con / Worldcon, where John Scalzi won his John W. Campbell Award as part of the Hugo Awards ceremony. This is a shot from the other major science fiction and fantasy awards, the Nebula Awards. I can't quite name everyone here, but the man on the left is Joe Haldeman, the bearded guy is Gordon Van Gelder (accepting an award for someone else), one of the women is Holly Black and the man next to Van Gelder, William F. Nolan, wrote Logan's Run. (This is as far as I got before looking the rest up in an sf photo archive for the caption). 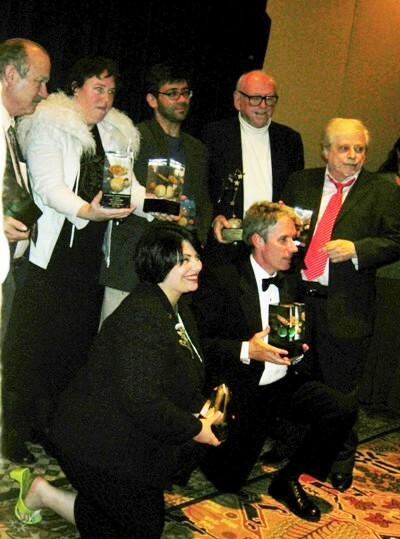 I attended the Nebula Awards Weekend in Tempe in May, pretty much to see my old acquaintance and matchmaker, Harlan Ellison (the guy with the red tie), accept his Grand Master Award. The Nebulas are voted on by members of the Science Fiction and Fantasy Writers of America (SFWA). The Hugos and the Campbell Award are voted by professionals and fans, specifically attending and non-attending members of Worldcon, an annual sf convention that is held in a different city and region each year. This year it was in Los Angeles. The Nebula Awards Weekend also jumps around. My mom had a few awards and honors over the years, but the ones I know about for sure, other than the books she was listed in, are the two awards shown here. Mom and a friend drove all the way from the Florida Space Coast to Hamilton, NY to accept this Colgate Award for Conspicuous Community Service. It was a bit of a lifeime achievement award: by then, her days with the Mental Health Association, Wagon Wheel and other charities were pretty much behind her. Still, I think it was well deserved. No, wait. That's not right. 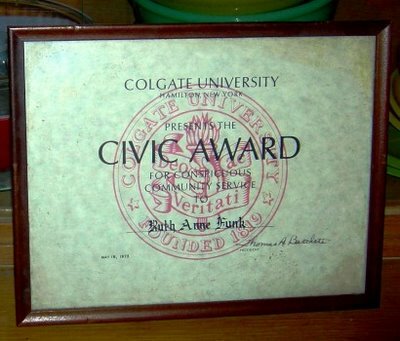 This award is dated 1973, when my parents were still married and living in Manlius, and Mom was still doing a lot of charity stuff. She must have made a trip to Colgate in the early 1980s for some other reason. Another award, perhaps? It's a shame that it's too late to ask her about this. In the 1980s, my mom wrote three one act plays about me and my friend Joel, none of which I've ever read or seen performed. 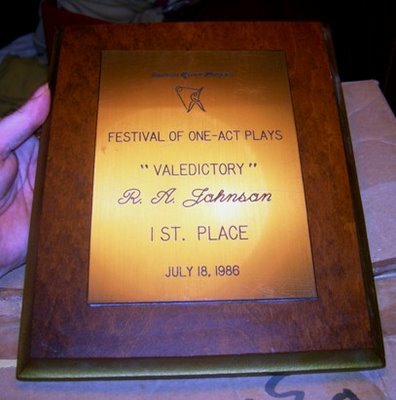 The first of them, Valedictory, took first place in the Indian River Players Festival of One-Act Plays for 1986. 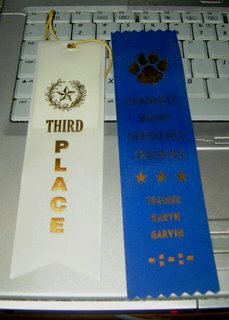 I think the second or third one placed but did not take the top prize. This bowling trophy sits forlornly in the corner of the window sill in the Accounting Department at work. It doesn't even have a person's real name on it. That's all, folks! If I ever win a physical award myself, you'll see it when it happens. Every Monday night, without fail, I post my entry to John Scalzi's Monday Photo Shoot. But today there wasn't one, because of the whole I-won-a-major-award and then-I-had-to-fly-halfway-across-the-country-so-I'm-tired-now thing. So what is obsessive Karen to do? I know. I'll make up my own Monday Photo Shoot, inspired by a Scalzi entry. I did get an honorable mention in some civics essay contest back in Manlius when I was in junior high, for a brief piece on the American Bald Eagle and DDT. As I recall, this was a surprise, because I didn't enter the contest. A teacher submitted it on my behalf. Maybe. It was over 30 years ago, and I forget the exact circumstance. And somewhere around here is a "Loose Cannon Award," designed by Don (now Seth) Williams of United Whovians of Tucson to honor club members who took it upon themselves to do something useful. I'm not sure whether it was actually awarded to me. It probably was, but I may just have copies of the printouts. In any case, I can't find a copy right now. So I guess we'll have to settle for the ribbons Tuffy got on the last night of an obedience training class. I think she got Second Place in one of the exercises, but I didn't find that ribbon in the box with the others. Come to think of it, I have an award of my Mom's around here somewhere. I'll try to add a photo of that later. Earlier tonight I had one of my periodic crashes in which I had to take a nap when I got home from work. I slept for about three hours, and then got distracted cleaning up the Paul Frees article on Wikipedia. (Paul Frees was the voice of Boris Badenov, Ludwig Von Drake, the Ghost Host at the Haunted Mansion, and lots and lots of other characters.) Now it's past 3 AM, and I'm in danger of wasting the benefit of my nap. So I'm going to do a very short photo essay on Musings to finish up my Tucson series, and go the heck to bed! The desert, including the critters, the cacti, the washes, etc. 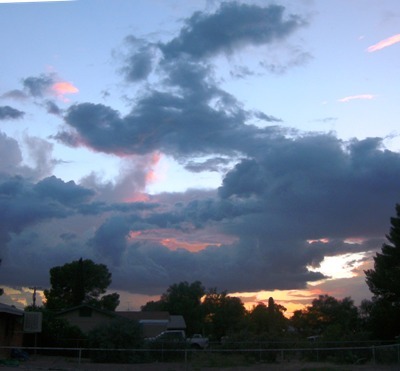 I covered the climate in this blog Thursday night, and the desert over in Musings the same night - not in the depth I wanted, but it was late and I just didn't have time to do anything too ambitious. Then I got busy with other things and didn't get back to the subject. Tonight it's late again and I'm tired, so I'm going to write about history and culture here tonight, and about the mountains in Musings tomorrow. To be honest, I'm no expert on Tucson history, but I've done some superficial research. There were people in this valley at least four thousand years ago, possibly much earlier. 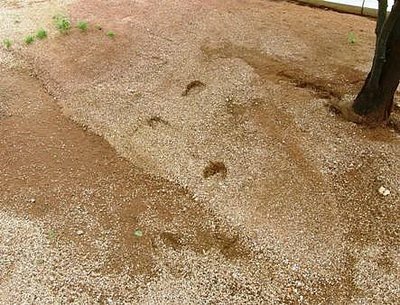 The Hohokam were here a few thousand years after that, almost up to the time of Columbus. Some of the modern day tribes - the Pima and the Tohono O'odham - may be descended from this "lost" civilization of builders, farmers and traders. Since then, Tucson has been a Spanish Presidio, then part of Mexico, then part of the U.S. after the Gadsden Purchase, then part of a Confederate Territory. The westernmost battle of the Civil War was at Picacho Peak, about fifty miles from Tucson. Inside one of the many Mexican restaurants. Having been part of Mexico, and being only an hour from the current Mexico border, Tucson has a strong Hispanic component to its cultural heritage. Aside from a zillion Mexican restaurants of one sort or another, Tucson has lots of Spanish place names. 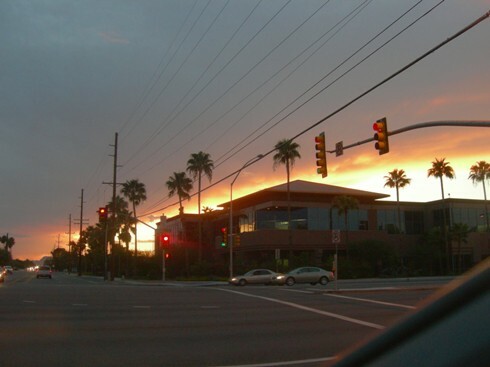 Most neighborhoods are filled with Calles and Avenidas instead of Streets and Avenues. Cinco de Mayo is a big deal here.This is as it should be, because over a third of the population is Hispanic, in one way or another. It's extremely common in Tucson to hear people switch back and forth between English and Espanol, many times in the course of a conversation. I kind of envy that bilingualism. Growing up almost as close to Canada as I now am to Mexico, I studied French in school, but I was never any good at it. Here in Tucson, there are thousands of people who are fluent in both of the languages most frequently used around here. I feel kind of bumpkinish not being one of them. There are,of course, many other ethnicities represented here: Tohono O'odham and Yaqui, people from India, Asia, the Middle East and Africa, and lots and lots of gringos from Back East, or even native to Arizona. 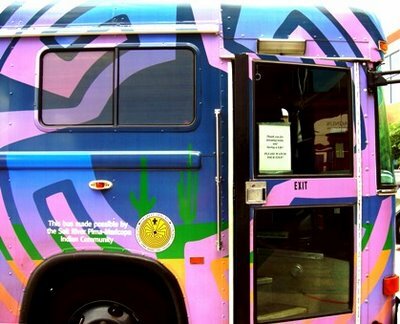 There's an annual outdoor festival here called Tucson Meet Yourself, where Tucsonans demonstate performing arts, arts and crafts, foods and other customs from around the world. Aside from "real" history, Tucson has a lot of fake western turista stuff. 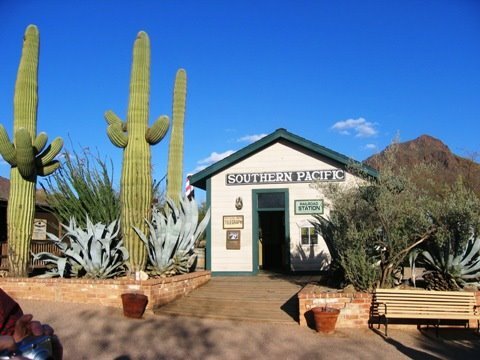 Old Tucson Studios west of town was first built for the movie Arizona. The tv series The High Chapperal was filmed there, along with parts of Rio Bravo, The Three Amigos and dozens of other Westerns. It doubles as an amusement park, having been rebuilt after arson. 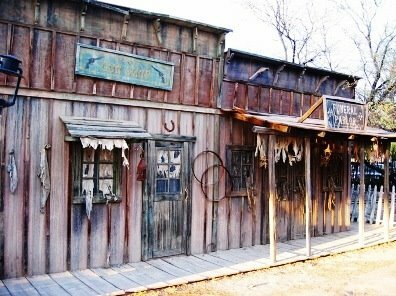 Another movie set on the east side became Trail Dust Town, home of steak and beans, gift shops, chocolate-dipped strawberries, staged gunfights, a small gauge train, an antique merry-go-round, the Museum of the Horse Soldier, and lots of scenic Old West buildings and decor. Yep, Tucson is an interesting place, all right! In other news, yesterday's mail included John's latest eBay purchase, a stack of Jack and Jill magazines from 1960. This is the magazine from which I got my first rejection slip as a writer, back when I was seven years old. We got them for a cover story about Kevin "Moochie" Corcoran at Disneyland. It was just a silly puff piece, and most of the pictures were in black and white; but it's still a cool thing to have. 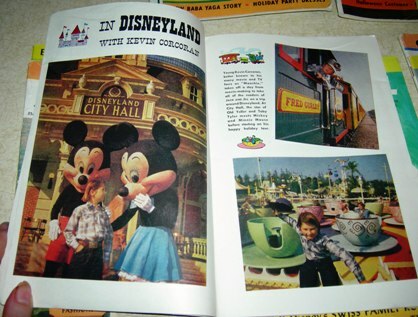 Another issue had a photo spread of Swiss Family Robinson, a Disney movie in which Kevin co-starred as Franz Robinson. 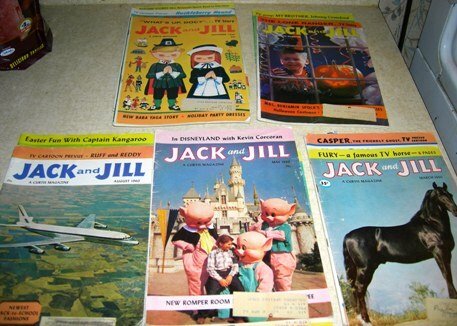 The other issues had fun surprises like Captain Kangaroo demonstrating Easter craft projects, and bad poetry about our brand new state, Hawaii. Coincidentally, I learned about Hawaii from Captain Kangaroo back in 1960. I was three years old. Moochie at Disneyland. What's with the long hair? The other news is that your friend and mine, John Scalzi, won the John W. Campbell Award tonight for best new writer in the field of science fiction. This is a huge honor, and although I still haven't read Old Man's War I have no doubt that the award is well deserved. If you've enjoyed Scalzi's writing, online or off, I urge you to go to By the Way or Whatever and offer your congratualtions. Meanwhile, though, having already done this, I'm going to bed! No staying up until dawn tonight, as I sometimes do on Friday nights. I'm exhausted. Tonight I was going to write about the other two interesting things about Tucson, but I'm postponing it. The beginnings of one of the entries for this is saved as a draft; I'll come back to it. I found out on Thursday that one of my co-workers from another department at Unnamed Largish Company is the daughter of a couple that lives two doors down from me. 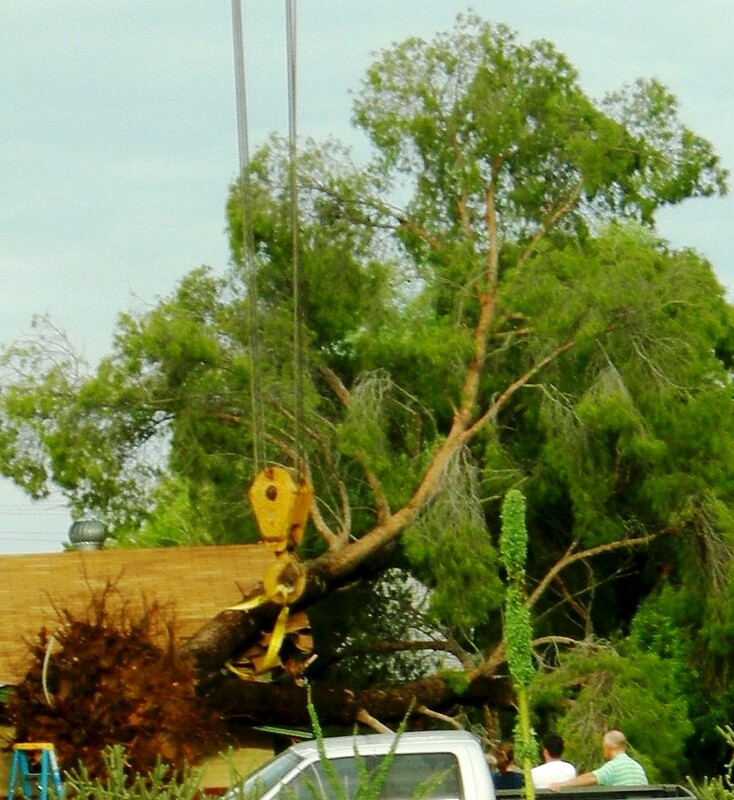 She gave me more details about the fallen tree that the yellow crane removed the other morning. Apparently the people whose roof was damaged had only bought the house this past spring They weren't home when the tree fell on the roof early Monday evening. 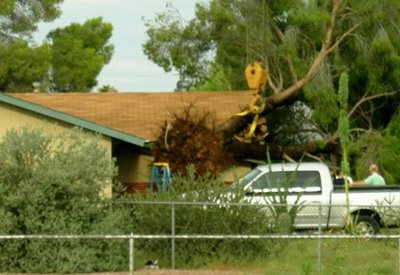 When they got back, half the neighborhood was outside looking at the tree and the damaged roof. It was even on the local news that night. I hope their insurance covers this! 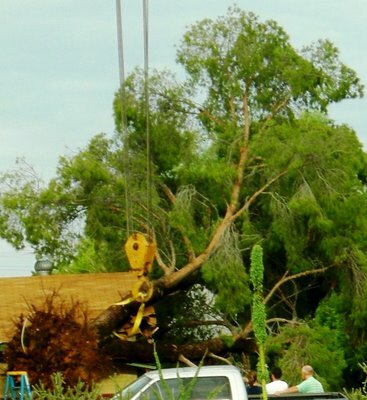 It wasn't a storm that brought down the tree, either, at least not in any immediate way. 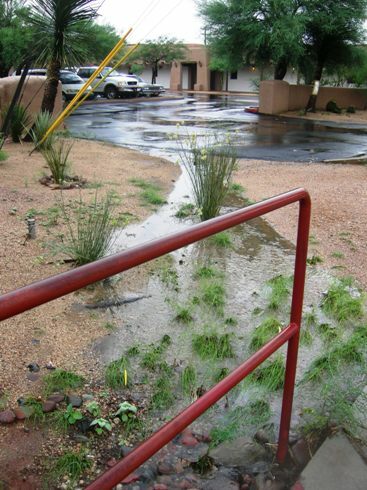 Trees around here often have shallow roots, so they can grab water near the surface of the soil when it rains. But a big tree with shallow roots isn't terribly stable, now is it? And here's another update: I haven't finished writing that email about my Heirs submission. As Julie pointed out, the people I need to reach at at Worldcon in L.A. right now, so emailing New York this week would have been rather futile. That's okay. I've waited six months for an answer on my partial-and-synopsis. I can certainly wait a little longer to contact the people at Tor about it. My eyes keep closing here. Good night! 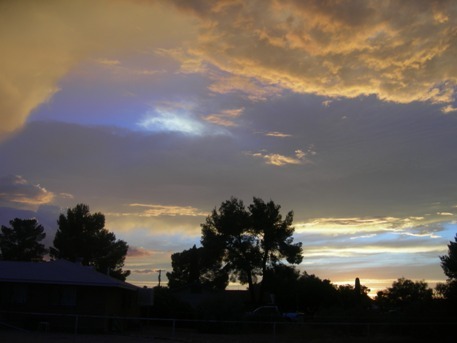 Your Weekend Assignment #126: What is the most interesting thing about where you live? "Thing" in this case would be a famous landmark, a famous current celebrity or historical personage from your home town or county, a notable celebration or sports event -- basically, anything that makes where you're from interesting and unique. Extra Credit: Are there any books that feature your home town (or someplace nearby) in any way? THE most interesting thing about Tucson? I don't think I can pick one thing. (Big surprise, huh?) I will tell you right off the bat that it's not Flandrau Planetarium, the Diamondback bridge or the statue of Padre Kino. Nor is it the fact that Lee Marvin lived here, John Dillinger was once captured here and Linda McCartney died here. Some Tucsonans might point to the University of Arizona basketball team, but I don't watch basketball. The Tucson Gem and Mineral Show is the largest in the country, but I don't care. No, no. 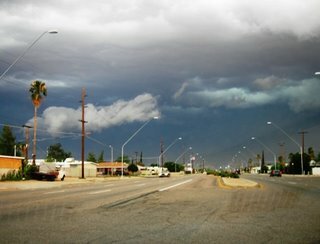 None of the suggested ways for a place to be interesting are even in the running as reasons I find Tucson interesting. Just to drive everyone crazy As an experiment, I'm going to write about two of these at the Outpost,and the other two in Musings. About an hour ago I went to check my facts on Tucson's John Dillinger connection, and ended up rewriting several bits in Wikipedia's article about Tucson. Mostly I was concerned that the article kept referring to the "monsoon season." Since monsoon basically means "rainy season," "monsoon season" ends up meaning "rainy season season." I grew up in Manlius, New York, outside Syracuse. I'll never forget some of the fun facts about Syracuse weather: 87 sunny days a year (the rest are partly cloudy, cloudy, rain, or snow), lake effect snow, sub-zero weather in winter, occasionally into the low 90s in summer, gray and humid and too often miserable. (Okay, that last bit was editorializing.) By contrast, Tucson claims 360 sunny days a year, which is only fudging things a little bit. Even on days when it rains, it's usually sunny in the morning. The weather is so nice in winter that most people don't even own gloves or mittens. It isn't every year that it snows in Tucson, even once, even melting as it hits. When the snow does "stick" for a few hours, it's a major event, and everyone with a camera takes lots of pictures. There can't be many people who enjoy a Tucson summer before the monsoon arrives, but it's interesting learning to cope with 110 degree weather, and realizing that people lived here for many centuries before the invention of air conditioning. The monsoon doesn't actually bring the temperature down to the "pleasant" range, at least, it seldom does so. But I find the monsoon endlessly fascinating. The clouds constantly find new shapes and positions for me to photograph, and make the sunsets extra special. Lightning and thunder announce the rain before it pours into the washes and the streets, making for what John and I call "dramatic weather." We love dramatic weather. Then again, we haven't had a tree fall on our house. Above: cool clouds, but where did the Santa Rita mountains go? August, 2006. 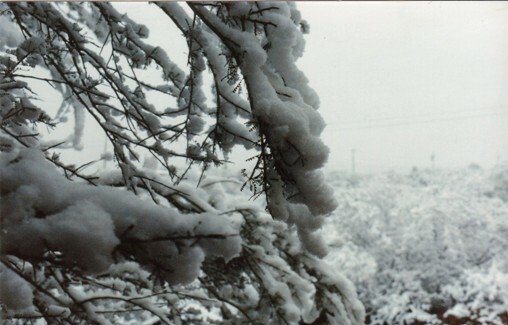 Top: a rare Tucson snow, 1987. Tree #1: It Definitely Made a Noise. When he got home tonight, John pointed out that I'd missed something important about the crane photos he took Tuesday morning. Below is one of the photos. Can you tell what I failed to notice and mention in last night's entry? 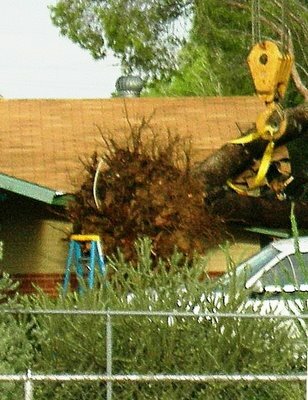 It's not just that our neighbors needed the crane to lift the tree. They needed it to lift the tree off the smashed-up corner of the roof! 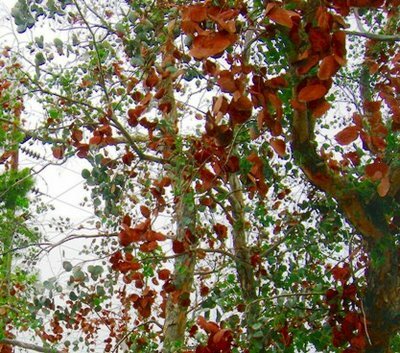 Two weeks ago, I showed you my favorite tree at St. Michael's, and told you that it was dying. 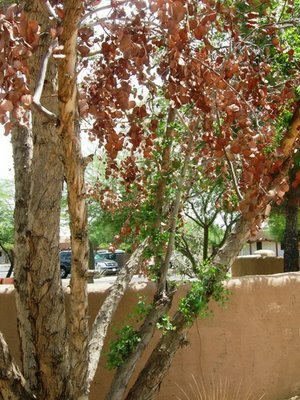 Nearly all the leaves on it were cinnamon chocolate in color - which it to say brown, which is to say dried up and useless, at least to the tree. The landscaping guy I talked to as he swept up the fallen leaves did not deny that the tree was as good as dead. Since then, I've said a few encouraging words to the tree each morning, expecting nothing. After all, there were basically no green leaves left on the poor thing. I think this was true as recently as a week ago. But look at it now! My tree is making a comeback! There are lots and lots of tiny leaves now on lower limbs and outer branches, places where there aren't any of the dead brown ones. Yay! It's going to live! Oh! They're so cool, these chlorophyll-rich little beauties! I did boost the color on these shots, to make the tiny leaves nice and visible and the overall pictures prettier. 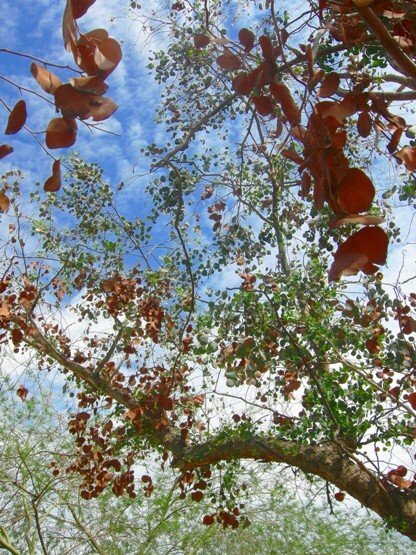 The brown leaves are a bit lighter than you see here, and a bit less red. Many years ago, I read about talking to plants, that a scientific study showed that expressing affection for a plant does have a positive effect on it. Evidently Madeleine L'Engle read the article, too, or one like it, because she incorporated it into a scene in A Wind in the Door. I'm not taking credit for this tree's miraculous survival. More likely the gardener guy did something that helped the coolest tree at St. Michael's. I'm just glad - thrilled, really - that the tree is going to survive after all. On February 23rd, 2006, at 10:22 am, the U.S. Postal Service recorded a certain large Priority Mail envelope as having arrived at a certain address in the Flatiron Building, New York, NY 10010. It was probably logged in by someone at Tor Books, who then added it to the slush pile. That's what happens to unagented work, and alas, it's been several years since I even tried to get a literary agent. Today is that envelope's six month anniversary on the slush pile. Maybe. It may not be there any more. It could be that someone has finally looked it over, seen that it's not utterly illiterate, and put it in another pile for further perusal. It's possible that someone liked it and wrote a little report on it, and now it's on yet another pile, awaiting Patrick's or Teresa's attention (or someone else's). It's even possible that it was rejected and mailed back months ago, and the post office lost it. But I hope not! Please allow at least four to six months for your manuscript to be considered. If you haven't heard from us after four months, and wish to make sure your manuscript got here, please write a letter stating the genre, the date of submission, and the title of the manuscript, rather than calling. We will respond promptly. I know it got there, and I know that Patrick Nielsen Hayden has described the movement of the slushpile as "glacial." Still, I'd like to know: has anyone actually looked at it yet? So anyway, I'm tinkering with my email asking about this. Those of you who helped with with the cover letter in the first place, I'd appreciate some advice on the follow-up email. I just posted it over on Inspirations (my LJ). Take a look, will you? Thanks! Round Robin: Transportation of What? Hi, folks! This week's Round Robin Photo Challenge topic, "Transportation," comes from Robin, of the blog These are the Days of our Lives.... So here's my entry, with a bit of a cheat: it features special guest photographer JBlocher, better known as John. I took this picture. No, really! I did! Although I loved this topic idea, I had no firm plans about what specifically this entry would be about - until I stepped outside this morning. 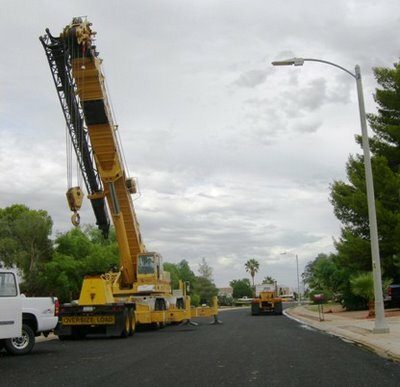 That's when I saw a vehicle I hadn't considered at all: a yellow crane. A neighbor across the street and around the bend was having a tree removed, and apparently needed heavy equipment to do it. I had to get some pictures! 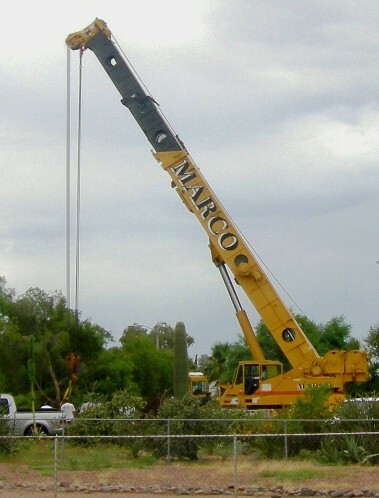 But wait: is a crane a form of transportation? Well, it was used to transport a tree, wasn't it? It also carried its driver to my neighborhood and back. You do know I can never do a straightfoward interpretation of one of these challenges, don't you? All right, then. I fished out my camera - I thought I'd forgotten to grab it, but there it was in my purse - and started taking pictures. Unfortunately, the more photos I took, the more it became clear the crane was done lifting things, at least for the moment. I was therefore surprised and pleased to zoom in on a few of the early shots tonight, and discover that they showed the tree being lifted after all. Half an hour later, John said: "Did you find the pictures I took this morning?" Oh. Well, it's good that John got the "money shot," since I didn't! The Gift of Life only comes in one color. The bloodmobile came to our building today. A week ago Saturday I was unable to donate because my iron level was "37," whatever that means, so I signed up to try again at the office today. In between, I ate a lot of beef and a fair amount of Cream of Wheat to get my iron up. Iron supplements don't cut it: there's a family history of hemochromatosis (which causes the buildup of iron), and I know from experience that I don't tolerate pills with iron very well. So I avoid such things - too much, apparently. I probably don't have the stupid condition at all, just a stomach that doesn't like aspirin and mineral tablets. Potassium pills make me sick, too. So anyway, I got a couple of pictures of the bloodmobile from the second floor window, went downstairs, checked in and came outside. Here's the other side of the bloodmobile. So, is this transportation? After all, it mostly just sits in parking lots all day. Ah, but in the morning it presumably carries at least some of those Red Cross nurses to the donor site. And at the end of the session, it's used to transport all that donated blood where it needs to go next. Salt River Pima-Maricopa Indian Community"
And here's the entr--no. That's the exit! Oops! Enter through the back, remember? Guess what? My iron was still only 37! I'll have to try harder to fix that. I did have an interesting moment before the bad news, though, reading one of the empty bags. Did you know that blood is by prescription only? Heck, who would want to go down to Walgreen's and buy some? Well, yes, Carly, vampires, but who else? Now go see what the other Robins are coming up with on this Challenge. As always, you're welcome to join in on the fun. Click here for details! These are the Days of our Lives - Posted! My Day and thoughts - Posted! Search the Sea - Posted! a new day, a new photo - Posted! Here, There and Everywhere 2nd Edition - Posted! Through The Eyes Of The Beholder - Posted! My Day, My Interests photoblog - Posted! Photographs & Memories Too - Posted! Blah Blah Blog - Posted! Today as AOL Journals (better known as J-Land) turns three years old, I think it's appropriate to horn in on Krissy's Anniversary Assignment and take a look at my past year as a blogger, and where I am now in my thoughts about all that has happened in that time. A year ago today, my "main blog" was Musings from Mâvarin. I also had a LiveJournal, and a fiction blog on BlogSpot, and I maintained a couple of BlogSpot blogs for St. Michael's. But everything on my fiction blog was also posted on Musings. I posted every night (or occasionally in the afternoon) there, and was thrilled when I tied with Vince for a Vivi Award. I had two entries in Musings on August 21st, 2005. One was fiction: Mall of Mâvarin, Part Twenty-Three. This rather silly spin-off from my Mâvarin books would continue for another ten entries. In the 8/21 installment, Li and Lee explained how people from Mâvarin could buy stuff at the transported remains of Shoppingtown Mall if they wanted to do so. So what have I to say about the anniversary? Not much, really. It seems to have been very quiet, quite unlike the month-long blowout people put together last summer. And that's okay. For those of us who blog here every day (or even read them, nearly every day), the AOL-J community is part of our lives. We celebrate it every time we click on a new entry or comment alert, every time we write an entry, every time we're out and about, seeing whatever is around us in terms of how we are going to write about it for photograph it for our next posting. Tonight, when I told John I wanted to see more of Hawaii, he said, "You just want to blog about it." No, that wasn't why, really! But of course, I would blog about it. I think that still pretty much sums it up for me, except that the community is a bit bigger now, AOL-J and Blogger and any other service used by people who do John's assignments or comment on our blogs. But I'm getting ahead of myself. 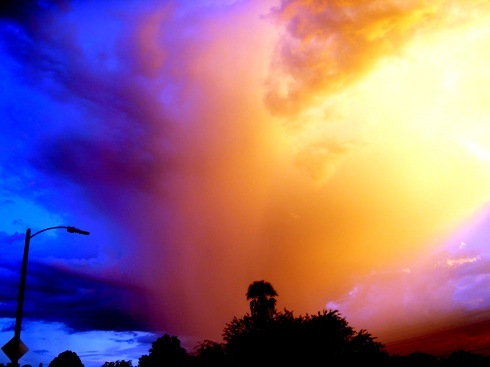 My last August entries feature dramatic monsoon pictures and tales of my tribulations at the gym. I really need to get back there! As August turned to September, I reminisced about my motorscooters, partly to hide the fact that I was at Disneyland over Labor Day Weekend. Eventually I started posting semi-obscure photos from my favorite amusement park before stating outright where I was. 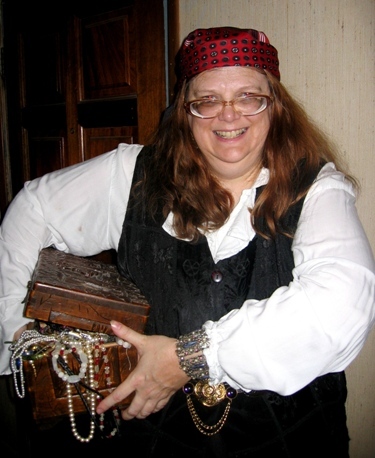 Black Rose Katie Specks made her first appearance on September 19th, in honor of Talk Like a Pirate Day. In October I was nominated for that Vivi Award, so I did some shameless promotion of my fiction and poetry, and posted at least one 30-year-old poem. Black Rose Kate turned up at my house just before Halloween, and hung around through part of November. November was also the month during which I became very fond of one of the mice in the house. We attempted to do the humane trap thing, and did manage to release one brown mousie - but I'm pretty sure Gray Mousie was killed in a conventional trap, rather horribly, too. You know what else happened in November. The infamous ads appeared. People got upset. Some people left. Some people stayed. Some people quit blogging altogether. The anger and recriminations were painful, and to an extent unnecessary. A lot of J-Landers moved into the development on the next block, to use a metaphor that I think Patrick came up with. Community spirit was battered but not broken, as people helped each other figure out this Blogger thing, and many bloggers and journalers started reading and commenting on blogs both on and off AOL. Myself, I moved over here. Along with the other things people were angry about, I was upset that a "charset" glitch ruined the word "Mâvarin" so that it could no longer be posted correctly. In a journal called Musings from Mâvarin, that was pretty much fatal. By the time the glitch was fixed, I was pretty well established here. So it was on Outpost Mâvarin that I blogged another trip to Disneyland, this time at Christmas. In January I finally received my Bachelor of Science in Business/Accounting diploma, ten months after graduating. I still kept up with John Scalzi's AOL-based Weekend Assignments and the Monday Photo Shoots, and in January Carly and I revived the Round Robin Photo Challenge. January through March I was exceedingly busy with year-end stuff, often working late at night at the office. Meanwhile, I serialized the first two chapters of Heirs of Mâvarin in Messages from Mâvarin as I gave the book one last edit. Readers got the play-by-play as I prepared to send my cover letter, three chapters and synopsis to Tor Books. According to the delivery confirmation slip from the post office, my life's work landed on the Tor slush pile on February 23rd. Wednesday will be the half anniversary of this momentous event. and no, I haven't heard a peep from Tor about it. Also in February, I went to the doctor about my edema after my brother had heart problems involving edema and sleep apnea. At the end of February, my beloved Canon digital camera broke, just short of a year after I got it. 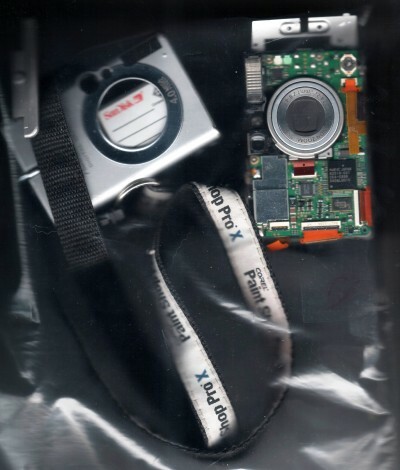 In March I got the Nikon, and foolishly did not return it when it started giving me error messages a few days later. Inspired by the 2005 series turning up on Sci-Fi, I wrote about Doctor Who, both the old and new versions. I pulled an all-nighter at work, and shortly after that, things started to ease off a bit. April was the month that I got sucked into Wikipedialand. I also blogged Holy Week, and my trip to Sedona and Los Alamos and Magdalena. That trip inspired my next serial, The Jace Letters. That thing would probably be over with by now had I not faltered badly in my weekly schedule of posting fiction. In May I did some bird blogging, drove to Tempe to visit Harlan Ellison at the Nebula Awards weekend, and returned to the Phoenix area a week later to meet Sarah face to face and eat some pizza. Sarah is much nicer than Harlan, but I don't regret either trip. May was also the month that fee-charging literary agent Barbara Bauer complained to an ISP that Absolute Write "illegally" posted her email address, setting in motion a chain of events that has caused me a great deal of stress in the months since - not so much because of Bauer or Absolute Write, neither of which meant anything to me before the incident (and hardly mean more to me now), but because one bitter individual has been trying to use Wikipedia to avenge perceived wrongs, and targeting me in the process. Also in May, my friend Eva turned 101, John and I got a DVD recorder (which promptly broke down) to celebrate our 27th anniversary, and I got a raise at my one-year review. In June I started out pretty happy, and even offered advice on the subject. But things started to build up: stress over the edit war on Wikipedia, and over things left undone. By the beginning of July, though, I got a prologue written for Mages of Mâvarin, after years of dithering about whether it needed one. Also, the tree in our back yard fell down. I wasn't here to hear it, but I'm sure it made a noise. 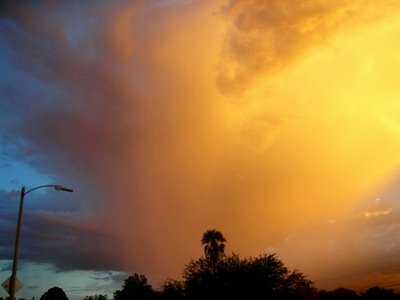 The monsoon got going, and I started photographing it along with the cloudy sunsets. That brings us back to August. What have I done this month? Wikipedia, mostly, but I am on Chapter Three, the bottom of page 94 at the moment, in editing Mages. AOL-J's anniversary ends in 14 minutes, so I'd better sum up. Since the strife of November last, AOL has gone through various changes and upgrades. Blogger is also rolling out an upgrade, but it hasn't reached me yet. I never did leave AOL, never reposted everything to the Outpost, never even got off dial-up. I'm still paying for AOL, $3 more than I was in November. And I'm thinking on this anniversary night of Musings from Mâvarin, with its last, angry post that promised my next one would be my goodbye to AOL. Tonight I'm wondering: would it be a terrible thing if I revived Musings, not as my main blog, but for Weekend Assignments and Monday Photo Shoots? I don't need another blog, but it's there already, and it seems kind of forlorn and battered, sitting there with its angry words and outdated postings. Would it be a good thing, a bad, thing, or neither if I were to revive it, and use it to post larger photos than fit here, or maybe run the occasional poll or video? What do you think? 'Cause I did one. My Monday Photo Shoot for this week is over there. I spent the afternoon asleep after another late night, and consequently didn't get much done today. I did get some pictures, though. 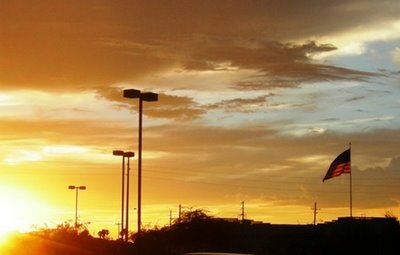 Even John, who gets annoyed sometimes with my obsessively grabbing the camera in the Safeway lot at sunset, wanted me to catch the backlit flag before the light behind it faded. I didn't quite manage it. The camera jammed and gave me an error message when I tried to zoom in, and I had to turn it off and on a couple of times before I got any picture at all. By then the flag was hardly backlit at all. It's getting obvious that I'm not going to be able to ignore my camera problem much longer. The battery was low, so maybe that was a factor in this particular failure. On the way home I held the camera out the window and took a few shots, but I didn't want to ask John to stop and let me capture everything my eyes saw. 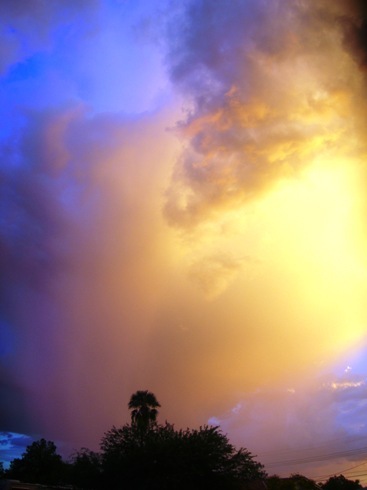 When we got home I noticed this huge, yellow cloud, too big to even fit in the camera's field of view. Here's an uncorrected photo of what I could capture in a single shot. Here's the same photo, autocorrected and with the contrast boosted. Usually I go for a very slight enhancement of what I remember actually seeing, but this came out so strikingly muticolored that I decided to push it a bit. The same cloud framed vertically, photo autocorrected again. My last shot of the day kind of came out delft blue. The only thing I did to this one was resize it. It's a little after 3 AM, and I have a meeting with someone from HR in less than six hours. I'm going to bed now. But I did get a tiny but of work done on Chapter Three of Mages, and went back to check all uses of the word Lopartin in the first two chapters as well. Lopartin is the ancient, arcane language the mages use in their spells. I wanted to make sure this is fairly clear from the first use of the word, and not explained over and over unnecessarily. I also updated the word and page count of the first three chapters on my little spreadsheet. It's gone up, but only by a few pages overall, mostly in Chapter One because of the prologue scene. I can live with that. At over 323,000 words, though, assuming the count on later chapters is still reasonably accurate, Mages of Mâvarin is much longer than the thickest Harry Potter book, albeit still shorter than The Lord of the Rings. I hope to find ways to shorten it a bit as I go along, but it's clearly going to have to be published as a trilogy, even though it's one long story. At least there's a precedent for that. It is an important and popular fact that my self-discipline leaves a lot to be desired. 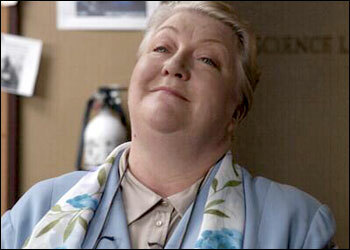 I doubt that even this woman would be able to get me to do what I should be doing, at the time I should be doing it. Who is she? She's Principal Amanda Durst (Valerie Boyle) of the Discovery Kids tv series Strange Days at Blake Holsey High. I wrote an entry about her on Wikipedia today, even though I haven't seen the show in a month or two. The character has been on my mind. I like her, and it bothered me that she's one of the few continuing characters on that series who didn't have an entry. It's anti-adult discrimination, I tell you! All the students in the Science Club have entries, and this particular adult character is as interesting as they are, in my opinion. Principals on kids' shows exist mainly to be an obstacle, someone to punish the protagonist if he or she gets caught. But Amanda's authoritarianism hides a wonky side that I find rather delightful. In writing and tweaking the Durst article, I happened to check the aticle about Lucas Randall, one of the five main teenaged characters on Strange Days. Someone had set up a one-sentence article about him and gone away, so of course I ended up writing that article, too. My day at 2 PM after sleeping in, which tends to put me behind on something else. Between writing those two articles, tweaks to a number of other Wikipedia articles, going out with John, and foolishly watching and Mythbusters and late night reruns of Lassie, somehow I've gone through the rest of the afternoon and evening and well into the night, without reading any of my non-AOL blog-jogging backlog, or working on Mages or poor, neglected Jace and Sandy. I'll try to do better tomorrow. But here's the thing. It's not as though I haven't done any writing today. I just haven't done any writing on the projects that I ought to be working on. In my head I've been writing about Amanda Durst since at least yesterday, maybe longer. I know I've been thinking about it for months. When some idea for writing starts to obsess me, at some point I just have to give in and write it. There have been lots of nights when words I needed to write forced me out of bed, because I could not sleep while they remained unwritten or untyped. It sure would be convenient, though, if I were inspired to work on the things I "should" be writing, instead of being distracted by some other project. Stupid muse! Help me finish The Jace Letters. Help me revise Mages. Don't distract me with all the articles I would write for Wikipedia. There are too many of them! Sorry, Rani and Darsuma and Talber. Sorry, Jace and Sandy. I'll make it up to you, I promise! P.S. Speaking of being inspired and not doing things when I should: I'm past due for mentioning that the latest Round Robin Photo Challenge is scheduled for this coming Wednesday, August 23rd. Appropriately, the topic, "Transportation" was chosen by Robin, author of the blog These are the Days of our Lives.... This is a wide-open subject, and I'm looking forward to all the entries people will come up with for it. If you would like to participate, just RSVP in comments to the topic announcement on the Round Robin blog. Then get ready to post your pictures on Wednesday, August 23rd! I'm tired tonight, folks, and I realized belatedly that I've already told most of the stories I had in mind for this entry. So I'm just going to link to some of these past stories and call it a night. You don't mind, do you? You do? Oh, well. I'm doing it anyway. I said last night that there are no "set pieces" that show John being funny. By that I meant that he's a banterer, not a practical joker or someone who does amusingly foolish things. But there is one exception to this: "The Cheese Story." Aha! It turns out I haven't told the Michael Jordan Story, although I've alluded to it a few times. Okay, briefly: I think it was in the fall of 1994 that John's sister Martha invited us to her wedding. That same autumn, basketball legend Michael Jordan was trying his hand at baseball in the Arizona Fall League, much to the annoyance of Baseball Weekly's Lisa Winston. She expressed to me a concern that the excessive attention given to Jordan would detract from talented young baseball players (such as Michael Tucker) getting the respect they deserved and the playing time they needed. Anyway, John bought a wedding card for Martie and Brad, and tried to get Michael Jordan to sign it. Jordan was too busy eating a burrito or something, and didn't even come to the fence to see what John wanted autographed. So we settled for giving Martie the card without the autograph, but with the story of how Michael Jordan had thwarted John's intention of giving the happy couple a card that said, Congratulations and best wishes from John, Karen, and Michael Jordan! 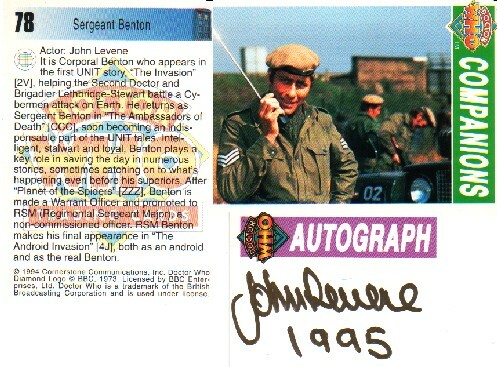 Two other funny people I've met over the years: the late Jon Pertwee and John Levene (a.k.a. John Anthony Blake), both from Doctor Who back in the 1970s. I only met Jon on one occasion, at Gallifrey One in 1990, but John is kind of a friend of mine. In an old AOL entry, I pay tribute to Jon Pertwee with a memorial joke, and tell a sample story from the John "Manynames" Blake collection. I'll post something better once I get some serious sleep. Good night! Weekend Assignment #125: Who is the funniest person you know in your real life [as opposed to an actor or stand up comic] and why? As the assignment says, you can't pick people who are professionally funny (unless you personally know someone who is, in fact, an actor or a comedian). We're looking for the friends or relatives or other people you know who crack you up every single time you see them. Extra Credit: Well, duh: Pictures of Mr. or Ms. Funnypants would be nice. This is the part where I should be telling you all about John, my beloved, about whom I frequently quote Jennifer Rabbit and say, "He makes me laugh." Every day he makes me laugh, with wit and whimsey and nonsequiturs and banter and wordplay and basic silliness. But it's all off the cuff and of the moment. I don't store up these things in my brain, because they are ephemeral, a moment's amusement with more to follow. There are no set pieces here, no monuments to "Yeah, he's funny." Even John thinks it best that I describe Robin's humor instead. Boy, will Robin be surprised. Who is Robin? Unless you've known me for decades, you may never had heard me mention the guy. I haven't seen him in over a decade myself, although I get emails and, rarely, a phone call. I've known him since he was a 13-year-old twerp named Gary, the youngest member of our Star Trek club. At one point we even considered setting a minimum age that excluded him from the group, but we decided not to do it. That would have been cruel. Funny how he's one of only two people from Star Syracuse for whom I still have an email address, the only one I've seen as recently as a dozen-or-so years ago. Robin Weitz is definitely a funny guy, and I do have a few Robin stories stored in my brain. Like the time he talked his way into Chevy Chase's dressing room, posing as "his brother, Gary Chase." 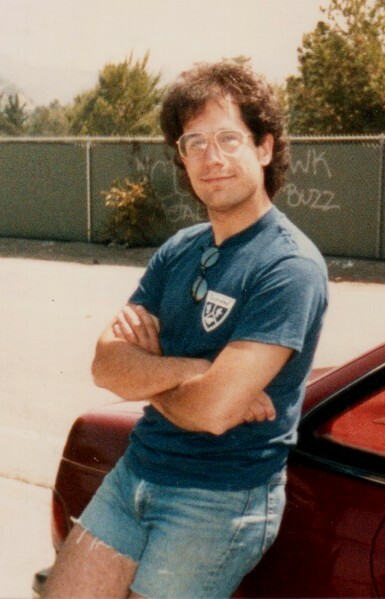 Or the time he took me to an Italian restaurant in Santa Monica when I visited L.A. in 1991 or so. He had just had a script rejected for the sitcom My Two Dads. Understandably disappointed, he had a few drinks, and ended up doing a fairly loud, dead-on impression of Christopher Lloyd as Reverend Jim from Taxi. People are the tables nearest us were so impressed that they applauded. Then there was the time he sent me a newsletter he wrote and edited for some troop of non-Scouts his kid is in. I think it was Indian Guides, or something like that. At least it had been. The newsletter was all about changes to the group as the result of their new corporate sponsor. Aware of cultural sensitivity issues over the name "Indian," this German company wanted to take the kids in a different direction, exposing them to German culture instead, even replacing their existing uniforms with leiderhosen. This was a controversial move, but the newsletter seemed to be glossing over the controversy. I think I read just about the whole newsletter before I decided it was no accident that it was dated April 1st. But my favorite Robin story was one he told me back in the late 1980s. He was working as an assistant at one of the major talent / music / literary agencies in Los Angeles. One day, he happened to pass Harry Belafonte in the hallway. Robin gave him a generic, "Hi, how are ya," not expecting to stop to carry on an actual conversation with the man. But Belafonte, who didn't know Robin in the slightest, threw him a little with the wording of his response. "How are you feeling?" the legendary singer asked. "Much better, thanks," Robin said, and moved on. I know I have a picture of Robin somewhere. I'll try to come up with it tomorrow evening, along with stories of a few other funny folks I know. Maybe John will be one of them. What a day! It started with an announcement on my clock radio that there was a storm and flooding going on in my part of town, "right now!" Tuffy, who gets nervous during storms, kept trying to hide between my legs, or climb into my lap as I got ready for work - and she's most definitely not a lap dog. I dug up my jacket because it has a hood, and because the last time I got soaked at lunchtime, I was chilly in the air conditioning at work all afternoon. 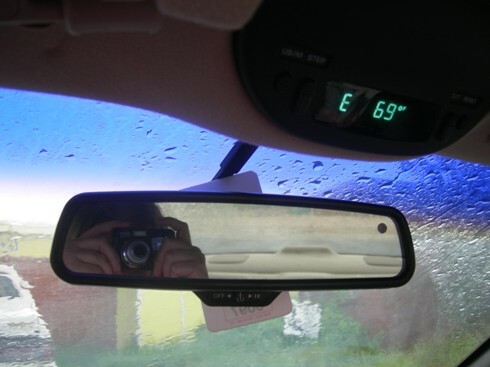 This turned out to be a good call, in light of the temperature my car thermometer gave when I set off this morning. This is August in Tucson? Well, yes. On this particular day, it was. I then spent twenty-five minutes making my six minute drive to the place where I park for work. There only seemed to be one disabled vehicle, but it was stop and go all the way. 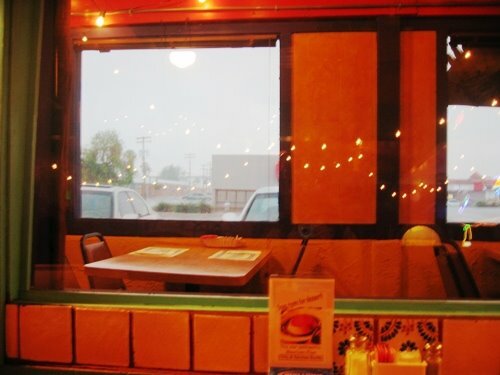 In this shot I was facing the mountains, but they were completely invisible. The right lane was about five inches deep in water, and the parallel access road was even more flooded. 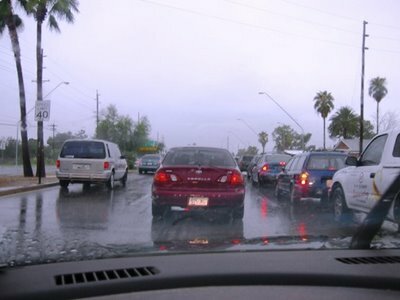 Impatient drivers sent wedges of water into the sky as they hurried past the buildings to my right. 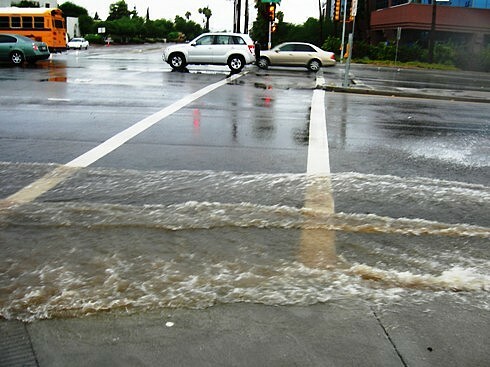 By the time I reached the Crosswalk of Death, the rain had eased off, but not the flooding. What you're seeing here is water slishing up over the six inch curb. I was going to have to walk through that in my sneakers, and make it snappy, too. Okay, so I had damp feet all day. So had many of my co-workers, because the crosswalk they used was no better than mine. I did see one woman who have the sense to wear fancy lace-up dress boots. Another co-worker sat in his car for 45 minutes until the rain eased off. When I went back to my car at lunch, the puddles were mostly gone, and it was getting rather hot and muggy. The indentations in the sandy soil above are my footprints, as photographed early this afternoon. In the morning, when I made them, the flooding had given the ground between the crosswalk and my car the consistency of quicksand. 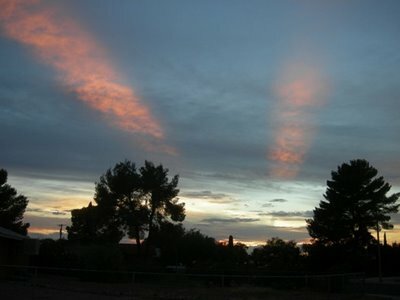 This is sunset from the previous night, kind of a pink searchlight effect. I just want to say in passing that I was also emotionally flooded today. Someone attacked me several times in a public venue, and I foolishly defended myself. Funny how after all these years, false accusations, my childhood bugaboo, can still drive me nuts. Several friends have given me good advice, though. I eventually managed a more mature response, and the crisis is probably over for now. I even got some editing in on Mages tonight. I had moved on to Chapter Three, but a fact a character shouldn't have known sent my back to Chapter Two to fix the problem. Progress! Who Needs Sticks and Stones? Two hours ago, I was about to write up a brief, lighthearted meme entry involving books, and then go the heck to bed, because I'm tired and I do better at work when I get more than six hours of sleep. Then I found out that something I said in another venue three weeks ago was just discovered by someone, and hurt his feelings. I didn't call him names, or say anything all that terrible, but others did, and my defense of him was weak at best. I was frustrated with the guy myself - not as much as with someone else in the same ongoing conflict, but definitely frustrated, and it showed. I accused him of "a little bit of bias," and said that something he had done was "deeply foolish." Yes, that's as harsh as I got, but that's bad enough. So I posted an initial reaction to his revelation that "foul comments" had been made, and that I had been involved. I didn't know what specifically I'd said, but I apologized anyway. Then I went back and read what I wrote back in July, stewed a bit, and wrote a much longer and more detailed apology. Now I'm going to bed. Maybe now that that apology has been issued, and I'd vented here, I won't lie awake brooding or crying. But don't count on it. Update: I've heard back from the person to whom I apologized, just a few minutes after I posted it. He told me not to fret, and said nothing but nice things to me. So now I'm glad that I got in touch with him immediately, and didn't brood overnight. I feel better now. Good night! Your Monday Photo Shoot: Show off a favorite space photo from NASA. Challenge for the folks who participated in the Photo Shoot last year: Pick a new photo you love. Given all the amazing photos from NASA over the years of space exploration, this shouldn't be difficult. Fair enough. In the spirit of the assignment, I'll stick to pictures from the 2006 Hubble press releases. Hubble has a strong University of Arizona connection, so I have a certain "brand loyalty" to the space telescope that could. 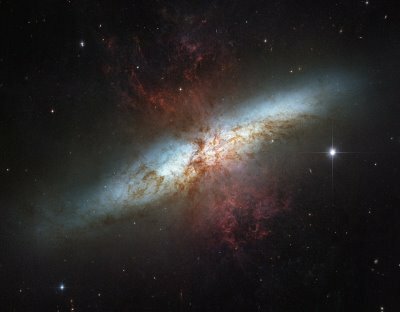 "This mosaic image is the sharpest wide-angle view ever obtained of M82. The galaxy is remarkable for its bright blue disk, webs of shredded clouds, and fiery-looking plumes of glowing hydrogen blasting out of its central regions. The observation was made in March 2006." I like that it's sort of an hour glass shape with a cloudy hula hoop shape around its "waist." Is this a broken piece of a glow-in-the-dark shoelace? No indeed. This is a big, flat galaxy, hiding from the Hubble camera by facing sideways (end-on). I saw a stealth bomber do that once over White Sands. 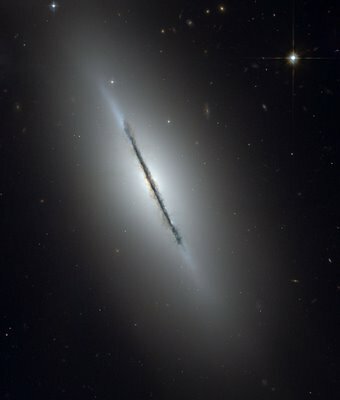 NGC 5866 is a disk galaxy of type "S0" (pronounced s-zero). Viewed face on, it would look like a smooth, flat disk with little spiral structure. It remains in the spiral category because of the flatness of the main disk of stars as opposed to the more spherically rotund (or ellipsoidal) class of galaxies called "ellipticals." Such S0 galaxies, with disks like spirals and large bulges like ellipticals, are called 'lenticular' galaxies. NGC 5866 lies in the Northern constellation Draco, at a distance of 44 million light-years. It has a diameter of roughly 60,000 light-years only two-thirds the diameter of the Milky Way, although its mass is similar to our galaxy. This Hubble image of NGC 5866 is a combination of blue, green and red observations taken with the Advanced Camera for Surveys in February 2006. There were other press releases I found potentially more interesting, but they tended to come with artists' renderings instead of photos. These were mostly about Pluto and its neighbors, both moons and bite-sized planets. For example, did you know that the Earth has a tenth planet, which Hubble has measured out to be slightly larger than Pluto? It's true! Did you know also that the tenth planet is called Xena by its discoverer? I swear, I'm not making that up! In case you were wondering, the planet Xena does have a companion called Gabrielle. Here's the picture of it that isn't an artist's rendering. Sure, it's disappointingly low-res, but the remarkable thing is that the photo exists at all. It shows almost nothing, but I think it's my favorite 2006 Hubble photo anyway. 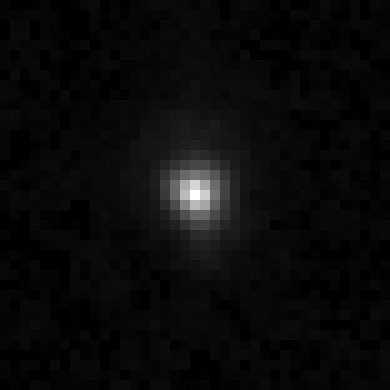 By the way, the boring name for Xena is Kuiper Belt Object 2003 UB313. Wikipedia lists other candidates and proposed names for the distinction of being the tenth planet in our solar system. And, final fun fact on this obscure planetoid (My Very Educated Mother Just Sat Upon Nine Pillows Xactly): did you know that The Tenth Planet is where the Doctor first encountered the Cybermen? I'm pretty sure it was a different tenth planet, though. It was called Mondas. D'Oh! How did it get to be 1 AM?...I mean 3 AM! But It Was "A Good Car"
RR: How Does Your Garden Grow? Writing Male Protagonists - Yeah. So?